Four half-day lecture series of the 2019 Annual Session will be available via a livestream. The Sleep Apnea and Evidence/Advances series and the two different Pre-adolescent Treatment series will be included. From free business portraits to the new FRED Talks (Free, Relevant Exhibitor Driven lectures), find out about opportunities and new options at the 2019 Annual Session. The 2019 Annual Session Planning Committee took note of the many changes and quickly growing trends in the specialty as they planned continuing education programs for the meeting. 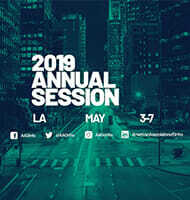 The House of Delegates (HOD) will meet on May 3, 2019 and May 6, 2019 at the JW Marriott Los Angeles concurrent with the AAO Annual Session. The World Federation of Orthodontists provides benefits to its individual members but also to the global support of “orthodontic treatment by orthodontists.” All AAO members are eligible to join for less than $50/year for a five year period. The 2019 Professional Advocacy Conference took place in Washington, D.C. with 118 members advocating for the specialty on Capitol Hill and a Washington insiders’ publication, Politico Influence, reporting on the conference. The AAO-supported RAISE Act, increasing the annual Flexible Spending Accounts (FSA) contribution cap, has been re-introduced in the House of Representatives and the Senate, with a sponsoring congressman’s press release quoting Dr. Brent Larson. “On February 16, Sharon Hunt transitioned to her eternal rest. This remarkable lady touched the lives of countless friends, family, and colleagues,” wrote Dr. Jim Vaden.